In Person Seminars - Earn Up to 16 CE Credits. 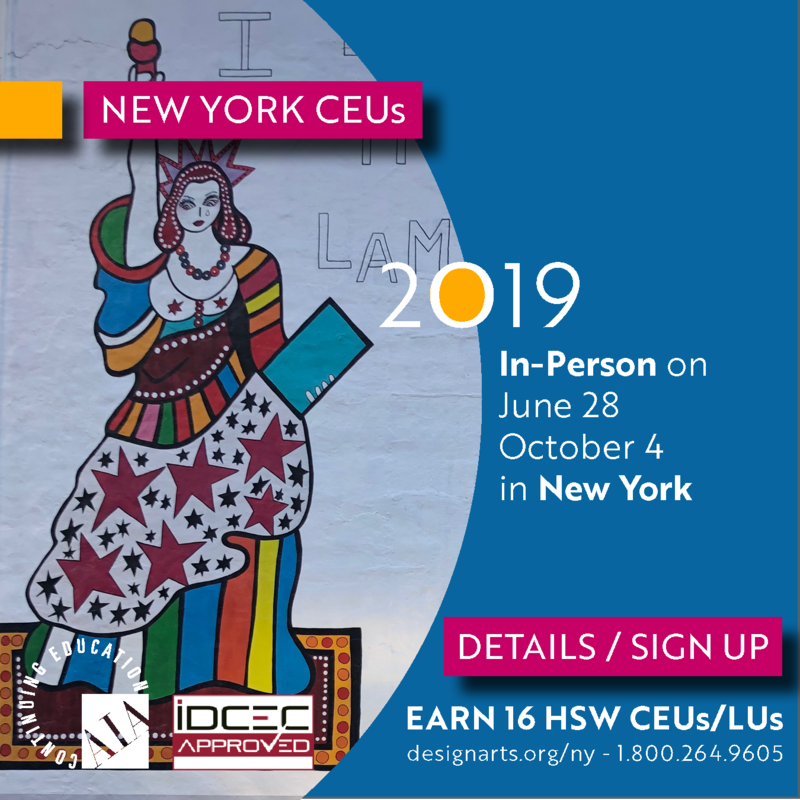 Join us on June 28th and/or October 4th, 2019 to earn up to 16 AIA- and IDCEC-approved HSW continuing education credits. Need more or fewer credits? Can't join us on 6/28 or 10/4? Prefer online courses? Check out our live and on-demand webinars. Prefer home studies? Check out our text-based home study programs. Breakfast, coffee, and mid-afternoon snacks will be provided. Lunch is on your own (plenty of eateries within walking distance). Clear the confusion surrounding the differences between accessibility laws, codes, and standards such as the ADA. Learn how accessibility requirements apply not only to commercial but also residential design and understand the repercussions of non-compliance in both cases. Discover how the Fair Housing Act and new Visitability codes impact residential design for both multi-family dwellings and single family homes. Whether you work on the exterior, interior, planning or implementation, you will benefit from attending. Identify and address potential issues of liabilities and lawsuits. Analyze the similarities and differences between ADA and state standards. Define what "visitability" is and how it relates to accessibility. Discuss the Fair Housing Act as it relates to the ADA. Lynne Wilkinson, RID, NCIDQ, NAHB, is Principal Interior Designer for the firm Draco Designs based in Austin TX. Her passion for design developed during 12 years working and traveling abroad in over 150 countries studying and lecturing on the art, architecture, and history of hundreds of cultures. These influences fused with an innate artistic aesthetic and technical abilities allow Lynne to create and oversee unique designs that are as individual as the clients. During her many years as an Interior Designer, Lynne has completed a diverse number of projects in both the residential and commercial fields. Lynne is a licensed Interior Designer in the state of Texas and holds an NCIDQ National Certificate for Interior Design Qualification. She has earned degrees from The Art Institute and The Ohio State University. Catch up on the latest kitchen design trends and learn how to incorporate cutting-edge technology, appliances, and materials. Discover how to design beautiful kitchens that fit the increasingly diverse needs of the most discerning household. Unlock the key to a kitchen that exceeds the expectations of the most eco-conscious clients. Master the best practices in kitchen design to enhance Health, Safety and Welfare for the end user. There is no time to waste. Join us! Identify how the 18 biggest global kitchen design trends impact design and the Health, Safety, and Well-being of the end user. Plan for technology in kitchen design. Identify ways to improve safety, accessibility, and energy efficiency. Explain the benefits of the new sustainable design features found in kitchen design. Master the art of designing with engineered materials such as concrete, quartz, glass, and terrazzo. Solidify your knowledge of the fabrication, installation, care, and refinishing processes to help you determine which materials to specify for your residential, commercial, or hospitality installations. Increase your knowledge of current green building codes and standards, and discuss how to solve the most common issues that arise when working with these materials. You will leave inspired and amazed at what you can do with concrete, quartz, glass, and terrazzo. List the characteristics of engineered materials such as concrete, quartz, glass and terrazzo. Determine which engineered material is best suited for a project. Explain the fabrication, installation, care, and refinishing processes for concrete, quartz, glass and terrazzo. Assess the environmental impact of concrete, quartz, glass and terrazzo. Fred Jackson, CTC, CSI, has over 25 years experience in national flooring distribution, leading to extensive product knowledge and training skills in all areas of the flooring industry. He has led quarry and fabrication tours in several states for the Marble Institute of America. Fred worked as a stone, tile and flooring contractor, Stone Business Manager for Aqua Mix, Team Leader of a national stone importer, Distributor Sales Manager for Del Piso Tile and Brick, Regional Instructor for Marble Institute of America (MIA), and Co-Chairman of Education for The Building Stone Institute (BSI). He frequently speaks at national trade conferences and shows. Presently, Fred provides training, and consulting for the natural stone, ceramic tile, and green building industries. Join us to learn how quality of life concepts related to air, heat, sound, and accessibility can help you improve the quality of life of all users in any building environment. In this information-packed seminar, you will learn how floor heating and sound reduction contribute to overall wellness. You will also learn what you can do to improve indoor air quality, increase accessibility, and allow for aging in place. If accessibility, health, energy-efficiency, and comfort are important to your clients, then this seminar is for you. Discuss features of a healthy building. Explain how sound isolation contributes to quality of life. Use floor heating to improve comfort and energy efficiency. Specify waterproofing membranes to avoid mold, mildew and carcinogens. Can't join us on 6/28 or 10/4? Prefer online courses or home studies? Need fewer or more credits? How many CE Credits will I earn? Each of the four continuing education seminars listed on this page are approved by the AIA and IDCEC for 4 HSW Continuing Education Credits each. Architects: Our continuing education seminars qualify for HSW Continuing Education Credits for architects licensed in NY as well as for AIA members nationwide. Interior Designers: Our continuing education seminars qualify for HSW Continuing Education Credits for interior designers licensed in NY as well as for ASID, IIDA, and IDS members nationwide. States other than NY: Our continuing education seminars qualify for HSW CE Credits in any state that accepts IDCEC and/or AIA-approved courses for CE Credits. The New York State Education Department, Office of the Professions, State Board of Architecture requires New York State-registered architects to complete 36 hours of continuing education every three years. All 36 CE Hours must be taken from an approved provider and in an acceptable subject area. AIA-approved providers are considered approved providers. For a list of acceptable subject areas, please read the answer to question 15 on the Board's FAQ page available here. Regarding the type of credit, a minimum of 24 of the 36 CE hours must qualify as HSW (Health, Safety & Welfare) credits. Regarding the delivery method (regardless of type of credit), at least half of the required credits must be obtained in-person by completing what the Board refers to as "courses of learning" and defines as activities in which the student has the opportunity for immediate interaction with an instructor/presenter, (e.g. a seminar, lecture, workshop). The remaining credits (a maximum of 18 CE hours) may be earned via distance learning by participating in what the Board refers to as "educational activities", which include self-study programs with a quiz and passing score (e.g. on-demand webinars, home studies), teaching a course, or giving a technical presentation. Can't join us in person in New York? Need more or fewer credits? Prefer online courses?